When your home has a roof leak that is more than just a simple roof repair in Downriver Michigan it’s time to get a new roof installed on your home. There are many techniques used today to install a new roof. One of which is called re-roofing or roof over. Getting your home re-roofed and save you money but it can also have some disadvantages which we will cover in this article. So if you are considering adding a new roof in Downriver Michigan to your home be sure to look at these disadvantages of re-roofing. After talking with a roofing contractor in Downriver Michigan you can quickly determine if re-roofing is ideal for your home. 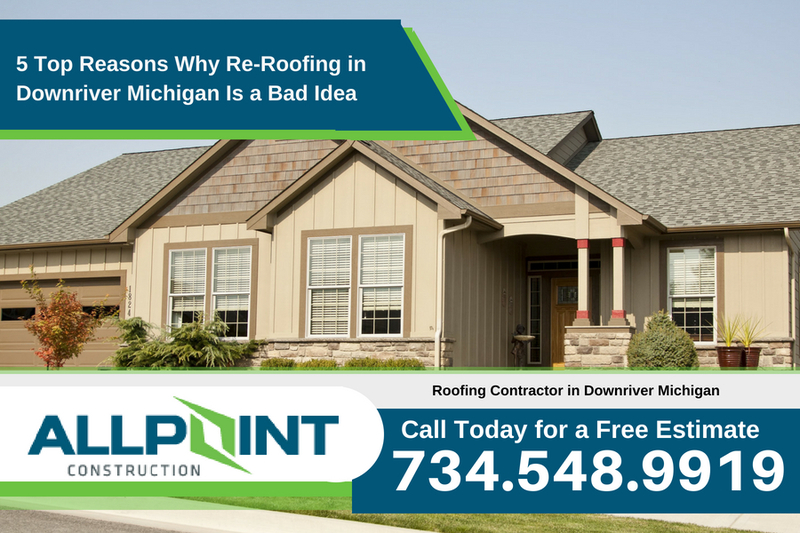 There are many roofing companies in Downriver Michigan that will re-roof your home but it may not be a good idea. Read the following reasons to help you determine if it is a good fit for your home in Downriver Michigan. Are You Replacing Your Roof Because of a Roof Leak? If your home had a roof leak that was damaging the interior of your home a re-roofing project will likely fix the roof leak. However, the roof decking may already be saturated with water along with insulation in the ceiling which can allow the damage to continue for some time. A complete removal or tear off of the roof is needed to address these problems rather than just covering them up. Another problem you may be faced with when re-roofing is damages to the roof decking itself. Since most roof decking is made of wood it is subject to rotting. When wood starts to rot because of water damage it becomes weaker and can’t support the roof as it should. If you re-roof your home these pieces of wood will not be replaced and you may not even know they are there until the roof starts to sag under the additional weight of the re-roof project. Making sure the roof looks good is also important. 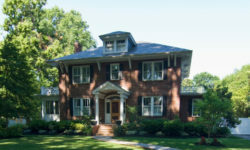 One area that is impacted in appearance by re-roofing is the eaves of the home. Having a buildup of asphalt shingles may not have a good appearance and will need additional work which may cost extra. Valleys are also a concern because they may not be properly flashed with metal under the old shingles. A valley typically has the most water at any given time of the roof so it needs to be protected and having your home re-roofed doesn’t give it that protection. It may not seem like a lot of weight looking at a single shingle but it can really add up fast. A full square of shingles can weigh more than 250 pounds and most homes have more than 30 squares of shingles. That’s almost 4 tons added to the top of your home. That much weight can wreak havoc on the structural components of your home. And that is only with one layer of asphalt shingles added. Some roofing contractors may even suggest 3 layers of shingles which is a really bad idea and not safe. In fact, local building codes in Downriver Michigan only allow for 2 layers of roofing shingles maximum installed on a home. 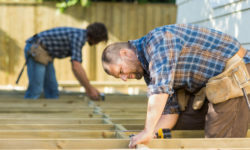 When you have a re-roof project done on your home it will typically come with a warranty but it may not last as long as it would if it were installed when removing the home’s old roof. There are many circumstances which will decrease the lifespan of the roof and many simply can’t be addressed properly if the home is re-roofed. Completely removing the old roof from the home is much better before the new roof is installed. This is known as tear off roofing. The cost difference of tear off roofing is more but it can pay off in the long run. To determine just how much either will cost in Downriver Michigan make sure you call the roofing experts at Downriver Roofers at 734-548-9919 for a free quote.